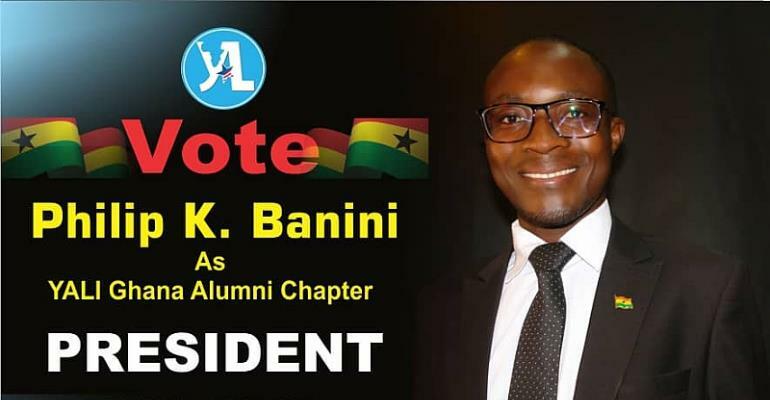 IWatch Africa Co-Founder, an anti-corruption institution based in Ghana, Mr. Philip Kwasi Banini has declared his intention to contest for the presidency of the Ghana alumina of the Young African Leadership Initiative (YALI), an initiative of former American President Barack Obama. According to him, his decision to contest the presidency is aimed at serving his fellow yalians in more deligent, transparent and above all with humility. Mr. Banini who is an alumnus of the Nigeria Cohort One (1), held in 2016 and doubles as a Petroleum Geoscientist from the University of Ghana, Legon, enumerated his ambition which is focus to harness and promote practical initiatives for and on behalf of the chapter if given the nod. i. Ensure the formation of Alumni Regional Chapters with elected executives who shall represent the various regional activity interest at national meetings. ii. Ensure access to resources for YALI activities and projects are decentralized to these Regional Chapters. iii. The decentralized chapters will promote inter-cohort interaction and collaboration as well as harnesses synergies for impactful regional specific and relevant projects and activities. iv. The decentralized leadership will be mandated to institutionalize an annual reunion and homecoming of members within those regions. v. National projects such as YALI Goes Green, YALI Innovations Awards, YALI Give Ghana Project, YALI Ghana Audacious and Mandela day celebration would be decentralized Regional Chapters to make greater impact. vi. As the national president, I will lead with the voice of Fellows and incorporate the elected regional chapter leaderships into the National Executive Committee (NEC) to ensure that all regional diversities in needs and service requirements are represented in the new age of YALI alumni transformation. VII. Lobby stakeholders into adopting these regional chapters and developing them into formidable coalitions registered with the Registrar General Department to give capacity to seek funding for community transformation programs, continuous capacity development and mentorship of members. The YALI Goes Green project is designed to plant over 10, 000 trees in communities across Ghana and to rehabilitate degraded forest reserves to improve local livelihoods and enhance resilience to climate change. This pilot project is committed to tackling deforestation and forest degradation and to strengthening institutional capacity in forest resource management to increase production of agricultural, wood and non-wood forest products to achieve the United Nations Sustainable Development Goals 13 and 15. The "YALI Goes Green" Project will be implemented by Regional Chapters in collaboration with Forestry Commission of Ghana, Ministry of Lands and Natural Resources and the United Nations office in Ghana. It is dubbed #YALIGhanaGoesGreenProject. The YALI Awards Project will be instituted to identify the social innovations and achievements of YALI Alumni members in recognition of excellence in their fields of endeavor. The YALI Awards Project is to inspire leaders and organizations to dream; create spaces for leaders to tap into their own creativity to innovate; endow leaders with the tools and knowledge to launch and grow their ideas; challenge leaders to become better versions of themselves, and transforming leaders and their organizations into Changemakers. The Awards Project will identify jaw-dropping ideas with the potential to spark change and formulate collaborative approaches to funding to create change at thrilling scale. viii. Innovations in Arts and Culture.
" *YALI Give Ghana* " Project will seek to adopt an orphanage and renovate some rural and community libraries in the 16 regions of Ghana. The Project will engage communities with resources and skill sets to make public libraries the guardians of heritage, active cultural, economic, educational and social catalyst for change and revitalization. He runs his campaign on the motto: A New Hope, A New Vision, A New Leadership for a Green Future. He called on his fellow contenders to endeavour to run a clean campaign deviod of hate speech and personal attacks. "I appeal to all alumni to consider my credentials by giving me the mandate to serve their interest in a more transparent manner".